SKOPJE, Macedonia - As an exercise in nation-building, Macedonia's latest effort is pretty audacious - an eight-story-high statue of Alexander the Great on horseback, in the center of the capital. 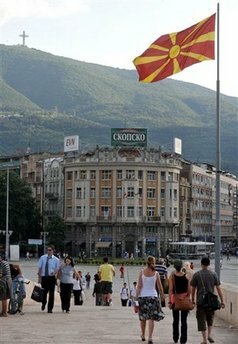 Some Macedonians are aghast, saying the planned statue will ruin Skopje's skyline, cost more than this poor country can afford, anger a powerful neighbor, even revive communal tensions in a country that suffered an insurgency by militants among the ethnic Albanian minority eight years ago. The ripples spill across the border into Greece, which lays historical claim to the ancient warrior and empire-builder and even refuses to let Macedonia call itself by that name. It sees the statue as the latest in a series of Macedonian nationalist taunts. The European Union has also weighed in, calling the project "not helpful." For Macedonia, one of seven independent countries born from the wreckage of Yugoslavia, the fuss over the statue goes to the heart of its larger predicament. The tiny country feels that its identity has been under attack from all sides since its independence in 1991: Not just from Greece but from Bulgaria, which considers its language little more than a dialect of its own, and from Serbia, which disputes the independence of its Christian Orthodox church. Most of its 2 million people are Macedonian Slavs, while one-quarter are ethnic Albanian, many of whom feel discriminated against. The toughest adversary is Greece, which has its own province named Macedonia and forces its neighbor to go by the cumbersome official name of Former Yugoslav Republic of Macedonia - FYROM, for short. Greece worries that FYROM has designs on the province of Macedonia and is increasingly suspicious of its propensity for renaming airports and highways after Alexander. The statue is the latest insult, provoking the Greek Foreign Ministry to ridicule it as "inversely proportional to seriousness and historical truth." Underlining their tie to Alexander, Greeks voting by Internet last month elected Alexander as the greatest Greek of all. The yearlong poll organized by TV station Skai gave the conqueror 127,011 of the 700,000 votes cast. Runner-up with 103,661 votes was George Papanicolaou, who invented the pap smear test for cervical cancer. Thessaloniki, capital of Greece's province of Macedonia, has long had a statue of Alexander, and in January the Greek and Iraqi governments agreed to put up a statue of the conqueror near the port city of Mosul, at the battlefield where he crushed the Persian army in 331 B.C. Meanwhile, Macedonia's prime minister, 38-year-old Nikola Gruevski, is pushing ahead with his plans to honor Alexander astride his horse, Bucephalus. The 22-meter- (72-foot-) high statue in bronze is being molded in Florence and will go up in 2010. Along with a church and another dozen statues of historical figures, the bill will total 10 million euros ($14 million), in a country where monthly wages average $440 and unemployment runs at 35 percent. Many Macedonians fear the project will stoke ethnic tension. Some ethnic Albanians are saying any new church in the square should be matched by a mosque. "The divisions are as deep as a canyon," said Radmila Sekerinska, former leader of the Social Democratic opposition. This is no time, she says, for "Alexander-mania". Few have forgotten how Serbian strongman Slobodan Milosevic roused extreme nationalist fervor in the dying days of Yugoslavia in the early 1990s, leading to wars in Croatia, Bosnia and later Kosovo. Gruevski's VMRO party doesn't just claim Alexander; in a pre-election ad aired on state TV, it said the white race emerged from Macedonians and spread from there across the globe. Alexander was born in Pella in northern Greece in 356 B.C. By the time he died at age 33, he had conquered much of the known world, reaching as far as India. But can either Macedonians or Greeks claim direct descent from him? "In terms of ethnicity, I think it's extremely difficult to say anything at all because there's been so much population movement in subsequent centuries," said Dr. Hugh Bowden, senior lecturer in ancient history at King's College, London. But "Macedonia was part of Alexander's territory and they therefore ... have as much right to a statue of Alexander as Athens does." British archaeologist Iain Shearer, a fellow of the Royal Asiatic Society, says neither side has any real grounds for claiming Alexander. "For modern Greece to say that Alexander was Greek is as absurd as Macedonians who claim that Alexander was Macedonian," he said. "The terms don't mean anything ... The only real commonality to the situation is accidents of geography and history."